Northampton Town midfielder Ian Morris admits their lack of goals away from home is "poor" and that they "badly" need to beat Bury next weekend. The Cobblers have scored six goals in 13 league and cup matches away from home, failing to score in ten of them. Morris, 26, told BBC Radio Northampton: "It's poor on our part. We can't just be relying on the forwards - we've got to be creating more chances. "The league is [back] next weekend and we need three points badly." 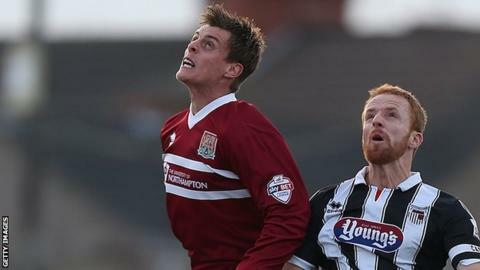 Northampton climbed off the bottom of the League Two table with a 1-0 win over Accrington prior to their defeat in the FA Cup second round by Grimsby. The Cobblers have secured two wins and a draw in their last five matches, but their away form, which has yielded just four wins in total last season, remains a cause for concern. "It keeps on happening this year," Morris continued. "We keep on losing games, having a bad run of luck and we're waiting for it to pick up really. "At times in every game we've showed what we can do, but it's about getting more consistency in our game. "Next week, hopefully it's three points against Bury, [we move] out of the bottom two and go on a march up the table."